Christmas is a time for countless useless electronics and appliances to be bestowed on hapless family members. That’s how people end up with electric forks, pizza scissors or hot dog makers cluttering up the dark corners of the kitchen. The fewer appliances you need to buy to cook all the things you love, the better. So instead of investing in an ice cream maker, food processor and pots and pans for soups, why not take a look at Breville’s latest blender? We think you’ll be impressed. Breville’s new blender, called “The Boss”, does some pretty conventional things … and some not so conventional things. For example, it can thoroughly process (thanks to an extremely fast moving/cunningly designed blade) a variety of foods to make dips, nut butters and freshly milled flour. The machine pulverises food very thoroughly and creates smaller particles that are (reportedly) more nutritious to consume. The Boss can also blend and cook soup, fold and kneed ice cream mixture, and blend you a “green smoothie” – all the rage with health-conscious hipsters. Here’s a clip of Heston Blumenthal making one of these green smoothies with Breville’s ‘The Boss’. 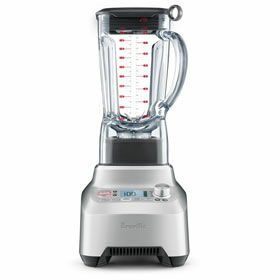 Another fun fact about this blender – its motor has three horse power, i.e. the strength of three massive equine beasts. That’s what we want when we need to make a monster serving of dip! Our judges liked the fact that The Boss is particularly effective at doing what it’s supposed to – blitzing food more smoothly than many other products on the market. The panel also thought this blender’s ability to heat up the soup as well as mix sorbet gives it an added edge on the competition. And that is why Breville’s The Boss blender wins our Innovation Excellence Award – it’s not just that it does more than other products, it’s the fact that it replaces several products in your kitchen, so there’s no danger of it sitting unused in the corner. Breville’s “The Boss” Blender retails at $999, but Appliances Online are having a limited time only Christmas Special for $822.